Here’s the Phoenix exoskeleton, a 27-pound wearable robot that could help everyone from disabled vets to kids learn how to ditch their wheelchairs and walk again on their own two feet. It costs $40,000. The Phoenix was designed by the California-based robotics company suitX, which specializes in medical and industrial exoskeletons. The suit’s based on research from the robotics lab at the University of California, Berkeley. And now it’s finally being sold to the public, albeit for a relatively steep sum. The exoskeleton attaches to the wearer’s hips and legs. Using buttons in the crutches, the user activates small motors in the braces that help propel their legs forward. 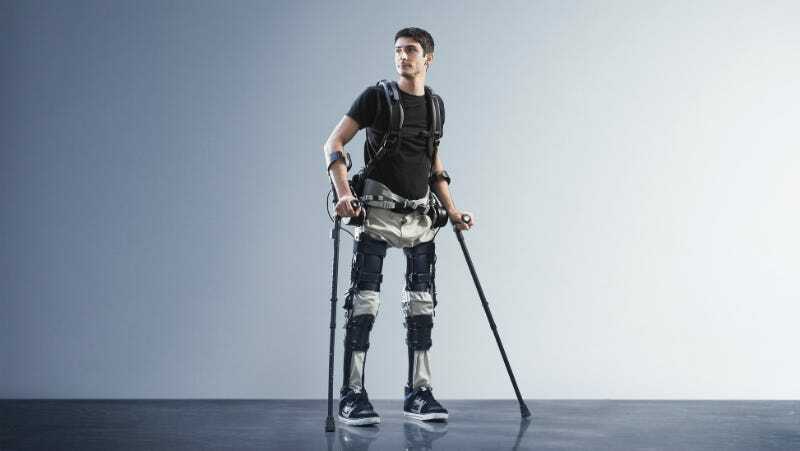 Unlike other exoskeletons that are being designed and prototyped in labs, this one is modular and can adjust to tall people or children pretty easily. Phoenix’s battery lasts for four hours of continuous walking and hits a max speed of 1.1 miles per hour. The patient’s physical therapist can help the patient control the suit’s gait by tweaking parameters with an Android app. This is all great news for a few reasons. Futuristic suits like the Phoenix stand to help humans in all kinds of ways. In the military or in factories, powered exoskeletons can help people lift 200-pound loads, like this mean device from Lockheed Martin. Other times, exoskeletons (like the Phoenix) are used to help patients regain mobility they’ve lost. Often times these are injured vets or accident victims whose traumas left them paraplegic. The company says that the Phoenix is mostly aimed at children with neurological conditions like cerebral palsy and spina bifida, who have a hard time walking—or might not be able to walk at all. This sounds great! The exoskeleton still has some issues, though. The Phoenix is light but it’s not super light. Harvard designed a prototype that could fit under people’s clothes. And Phoenix is definitely not cheap. But it is available for retail, out of the confines of a lab, and is now available to help real people who need it. And for those folks, the independence they can reclaim is probably worth the price tag. Video of the prototype from 2014.